We consistently publish fresh pieces of content focused on helping brands grow. Join our newsletter Join our newsletter to stay updated. AddShoppers provided the Brand’s merchandising, analytics, and CRM teams, as well as brand managers, the opportunity to gain control of their own site and be agile in their marketing. AddShoppers On-site Marketing Platform (OMP) was selected to enable marketing teams to work independently of developer resources for the eCommerce site. The AddShoppers and IBM Websphere integration were completed with less than an hour of developer resources. The first round of marketing campaigns was launched 15 days later. The Brand’s marketing team was able to launch three campaigns - Refer-a-Friend, Behavioral Targeting, and Sharing Buttons. These campaigns were used jointly to increase new customer acquisition, reduce shopping cart abandonment, and track on-site engagement back to ROI. Utilizing our control test in the calendar year of 2016, the Brand set their split to 98% of site traffic exposed to AddShoppers OMP and the other 2% of site traffic acted as the control group. Our platform lifted the site from a 5.68% conversion rate to a 9.91% conversion rate. That’s a 74.47% increase in conversions. 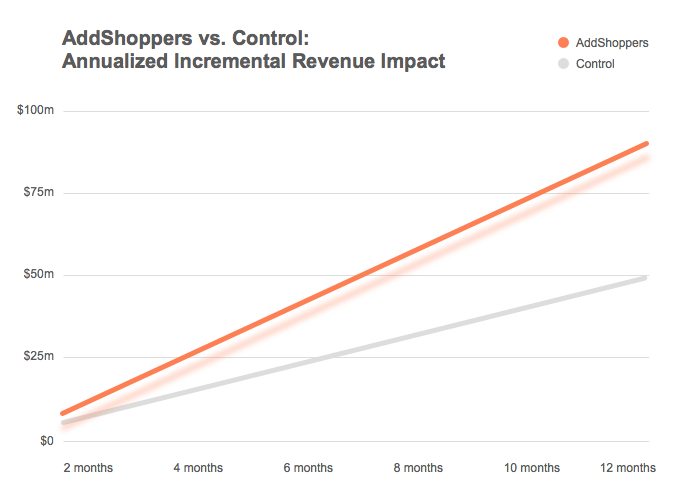 The brand tested different Behavioral Targeting campaigns to incentivize checkout. Initial campaigns showed an increase in revenue, but low ARPV. A/B testing of timer length: Cart Abandonment top bar running for 30 minutes in Test A, and 60 minutes in Test B both showing 10% off incentive. Incentive adjustments: Lowered Free Shipping qualification range to $30-50. The aforementioned campaign adjustments offering a more targeted incentive based on cart size and continuous addition of campaigns throughout the year resulted in an overall ARPV increase of 84% and 5.78% lift in AOV. Since the deployment of their initial campaigns, the Brand continues launching additional campaigns with their average deployment and optimization time at roughly 2 hours. With their substantial traffic volume generating actionable data; their team, along with AddShoppers are able to make adjustments on the fly. Over the 2016 calendar year, AddShoppers has helped generate an additional $72M in incremental revenue when compared to the revenue per visitor figures found in the control group. Want to increase your average revenue per visitor? Talk with us.